Urothelial hyperplasia (simple) from a male F344/N rat in a chronic study. 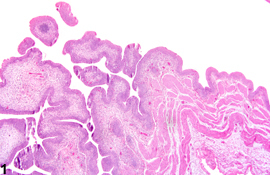 Urothelial hyperplasia (simple) with minimal inflammatory infiltration of epithelium and submucosa, from a female Harlan Sprague-Dawley rat in a chronic study. 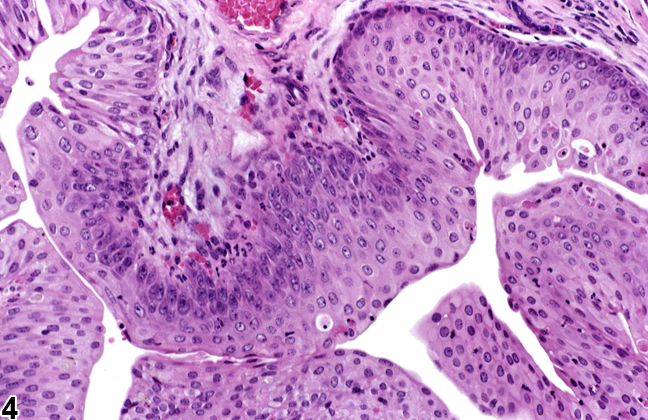 Urothelial hyperplasia (nodular) from a male F344/N rat in a chronic study. 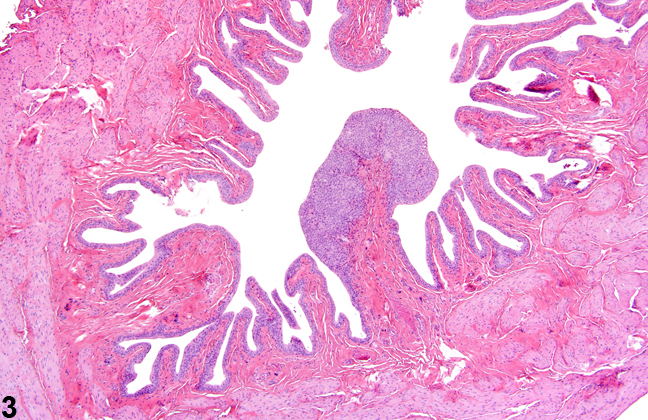 Urothelial hyperplasia with little to no inflammation, from a male TG/RASH2/CB6F1 mouse. Urothelial hyperplasia, defined as an increased number of epithelial cells, is commonly observed with inflammation, with the presence of calculi, or as a response to chemical administration. In general, hyperplasia can either be simple, nodular, or papillary ( Figure 1 , Figure 2 , Figure 3 , and Figure 4 ), which may not be important to diagnose for occasional and spontaneous cases. Most cases of hyperplasia are focal to diffuse. Hyperplastic cells may be normal in appearance or pleomorphic, or (rarely) may have atypia. Mitotic figures are variable. Metaplastic foci of squamous, glandular, or mixtures of cell metaplasia may be noted. 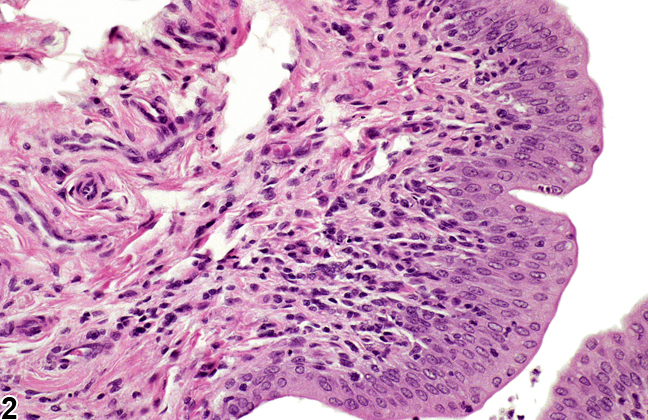 Urothelial hyperplasia may be reversible but may also progress to neoplasia. Hyperplasia is less commonly observed in the mouse. Minimal hyperplasia is difficult to diagnose because of the variability of the bladder appearance during fixation. 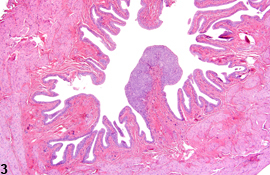 Usually a guideline of an increase above the normal 3- to 4-cell-thick urothelium constitutes hyperplasia. However, sectioning also poses a difficulty in determining minimal or borderline hyperplasias because of folding of the bladder lining in nondistended states. Care should be taken to not confuse tangential sectioning as hyperplasia. Hyperplasia should be diagnosed and given a severity grade. Hyperplastic modifiers such as “simple,” “nodular,” or “papillary” associated with chemical exposure should be discussed in the narrative report. Cohen SM. 1989. Toxic and nontoxic changes induced in the urothelium by xenobiotics. Toxicol Appl Pharmacol 101:484-498. Cohen SM. 2002. Comparative pathology of proliferative lesions of the urinary bladder. Toxicol Pathol 30:663-671. Cohen SM, Cano M, Anderson T, Garland EM. 1996. Extensive handling of rats leads to mild urinary bladder hyperplasia. Toxicol Pathol 24:251-257. Gaillard ET. 1999. Ureter, urinary bladder and urethra. In: Pathology of the Mouse: Reference and Atlas (Maronpot RR, Boorman GA Gaul BW, eds). Cache River Press, Vienna, IL, 235-258. Greaves P. 2007. Histopathology of Preclinical Studies, 3rd ed. Elsevier, Amsterdam, 591-592. Jokinen MP. 1990. Urinary bladder, ureter, and urethra. In: Pathology of the Fischer Rat: Reference and Atlas (Boorman GA, Eustis SL, Elwell MR, Montgomery CA, MacKenzie WF, eds). Academic Press, San Diego, 109-126. Kunze E. 1998. Hyperplasia, urinary bladder, rat. In: Monographs on Pathology of Laboratory Animals: Urinary System, 2nd ed (Jones TC, Hard GC, Mohr U, eds). Springer, Berlin, 331-368. Shinohara Y, Frith CH. 1981. Comparison of experimental and spontaneous bladder urothelial hyperplasias occurring in BALB/c mice. Invest Urol 18:233-238.